« Eurozone contagion part 2: the line between creditor and debtor-states blurred. One thing that is too often absent in the debate about immigration in developed countries has been the so-called “Brain Drain.” This term is used to describe the trend of mass emigration of skilled/highly educated workers (also called “human capital”) to a few high interest places. This trend has been documented both between countries and inside of countries. In the US, this has been described as “rural flight” while the international phenomenon continues to be called either “human capital flight” or simply the “brain drain.” Most developing countries see some form human capital flight, be it Ethiopia’s loss of doctors to Chicago or the high percentage of Chinese who study abroad and choose to stay abroad after graduating. While these countries lose human capital, many developed countries gain human capital as a result of this. 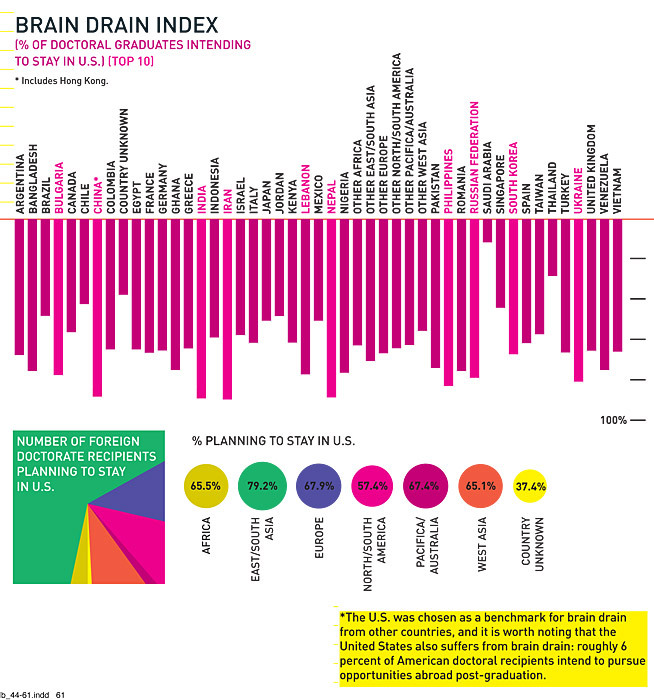 Something that’s always interested me when it comes to maps/graphs about the brain drain is they often break down either by country (which country is gaining and which is losing) or they only focus on recent statistics (who is moving where right now). 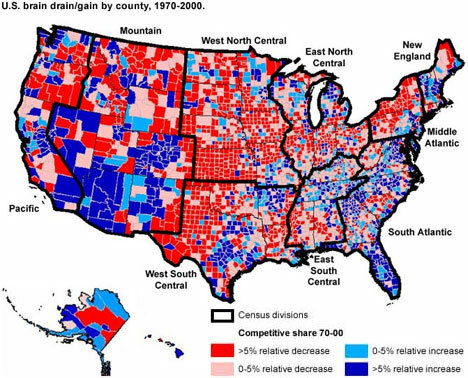 Instead I would like to look at which parts of the US have the highest concentration of educated/skilled individuals. This is not intended to rank how intelligent parts of America are, or to malign the parts of the US where educational attainment is low. Instead I want to look at where the highest concentration of people with at least post-secondary education reside in the US. I decided to use the American Human Development Project in part because it allows you to measure these indicators by state but also by Congressional District (CDs). I think this is the best metric because US congressional districts have to be at least similar in population, only small states like South Dakota have wildly divergent congressional district populations. 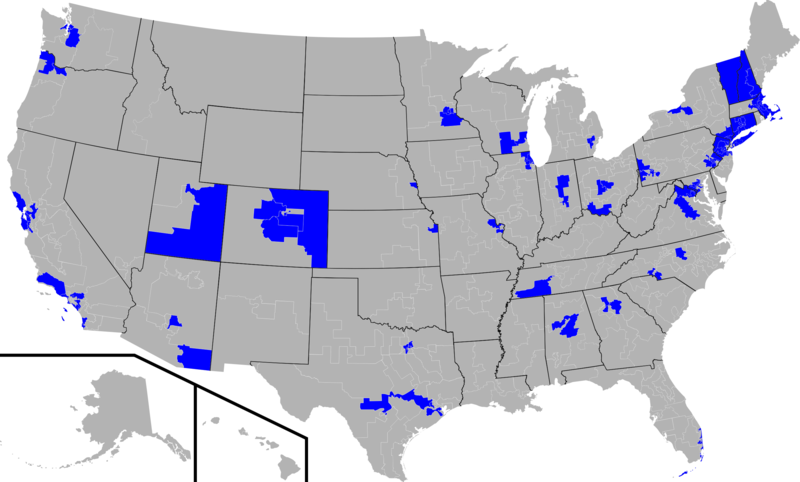 Of course there are other problems that can threaten congressional districts as units of measure: they can be gerrymandered to include disproportionate percentages of groups for political reasons. But while this could threaten the reliability of statistics on educational attainment, I don’t think it threatens the reliability of broader observations about educational attainment in the US. Many things can be noted from this so I will just list them first. The the states with the most CDs with at least 32% populations with a BA are: California with 18, New York with 13, and then Massachusetts with 8, several states then tie with 7. States not on the list include: Alaska, Arkansas, Delaware, Hawaii, Idaho, Iowa, Kentucky, Louisiana, Maine, Mississippi, Montana, N. Dakota, Nevada, New Mexico, Oklahoma, Rhode Island, S. Carolina, S. Dakota, West Virginia, and Wyoming. This pruning yields some interesting results. While many metropolitan areas were represented on the former map, this updated map excludes many large cities. only 4 CDs from southern states are listed, which makes them notable. The Research Triangle in North Carolina (a region where UNC, NC State, and Duke intersect) is represented, 2 CDs from the Atlanta metro area and one from Houston are included. 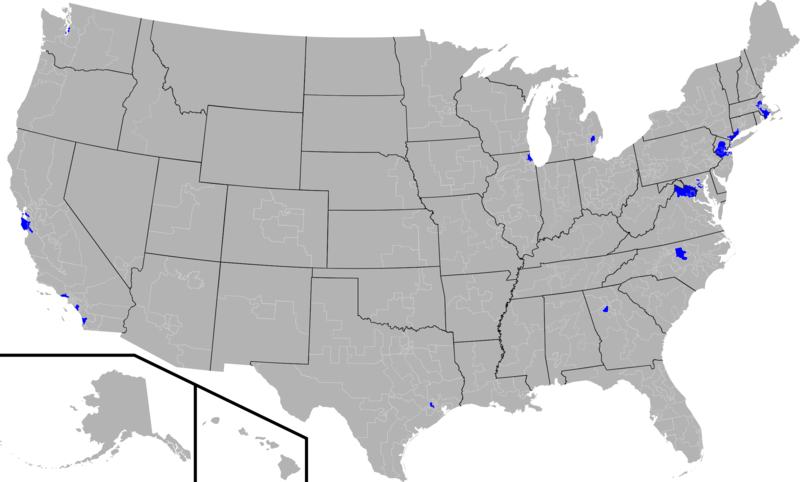 The Boston-Washington DC corridor is well represented with 16 CDs, while California has 7. What’s notable about California is that when you raise the threshold to 45% it actually puts the Bay Area on top with 4 CDs, compared to the rest of the state’s 3. Here we see that like in the other graph, the Boston-Washington corridor and California are leading the nation with 16 CDs and 7 CDs respectively. In addition to these dominant regions, Seattle, Houston, Chicago, Atlanta, and the NC Research Triangle appear to have to highest concentration of human capital. Finding out where the largest concentration of human capital is a much easier question to answer than why that concentration exists in the first place. Here are some of my less informed ideas about these maps and why we find concentrations of human capital in a few places. One immediate assumption I had was that these elite regions must have the highest wages in the country and thus attract the most human capital as a result. But surprisingly, the top 30 districts didn’t directly correlate with higher wages. Comparing Income Index with % Master’s/professional degrees produced almost as many mismatches as it did hits. None of the Boston metro districts made it to the top 30 in Income Index and Seattle and 8 others were also not in the top 30 Income Index districts. I am by no means asserting that wages and education don’t correlate here, just that they don’t perfectly correlate this instance. But some broad observations do appear to hold true: places with more than one elite university in near proximity tend to have more human capital (UC Berkeley+Stanford in the Bay Area, Boston’s plethora of top schools, The Research Triangle’s UNC+Duke, etc.). There also appears to be a based on type of industry for at least a few districts. Microsoft and Amazon.com are headquartered near Seattle and Boeing was headquartered there and still operates a large plant in the region. The importance of Silicon Valley cannot be understated: Facebook, Apple, Google, and Intel are all based there. Washington DC’s role as the epicenter of national political life and most federal agencies makes the region’s concentration of human capital almost inevitable (Imagine the human capital the CIA, FBI, NSA, DoD, DoS attract?). Finally, places of commerce like Houston and Chicago probably attract a great deal of human capital with a combination of incentives. I think the question of critical importance for regions that lack these advantages in attracting human capital (be it a lack of quality universities or lucrative industries) is to attract human capital using alternative methods. According to one source, making housing attainable in the urban core where they say amenities/diversity/jobs/social life are usually concentrated. A compelling blog was written about attracting smart people to cities that rates cities by their potential and actual college graduates by sq/mile. Personally, I just hope that my city doesn’t get left behind in the zero-sum competition over human capital. This was the most entertaining economics post I have read in a long time. Thanks for taking the time to troll through all that data! I was surprised you neglected to mention NH, which recently was ranked #1 for average household income (which honestly I found astonishing given I live there). This is very thorough and well-researched. Today I visited Esch which is in southern Luxembourg and we were discussing the industry in the country and how in the south, it used to be steel and other metal production/mining but since there is no more of this, the big city is what is holding up the rest of the country. In Esch, they are under lots of construction to expand the university campus because their theory is that some towns in the region (such as Trier) are basically held up and made substantially better because of the university. Attracting more people to get a degree also will hopefully boost businesses, which will hopefully boost employment. Interesting stuff. Esch is fascinating- it was like walking into another world, it was SO ethnically diverse from what I could see at face value. I guess 51% of Luxembourg is composed of non-Luxembourgians. when countries develop unevenly part 2: Turkey.